It is a real delight to join you at the Hong Kong Association Committee Lunch. I recall with fond memories of our gathering in June last year to mark the 20th anniversary of the return of Hong Kong. Time flies. Since then, we have had an extraordinary year for China, for Hong Kong and for China-UK relations. China entered into a new era for socialism with Chinese characteristics and embarked on a new journey of major-country diplomacy with Chinese characteristics. Hong Kong has been rated one of the world's most competitive economies. Prime Minister May paid a successful visit to China at the beginning of this year. This has upgraded China-UK relations to a more strategic, practical, global and inclusive level. The cooperation between our two countries across the board has borne rich fruits, with the Belt and Road Initiative promising a great prospect. First, we need to seize the opportunity of China's further reform and opening up. This year marks the 40th anniversary of China's reform and opening up policy. President Xi Jinping announced at the Annual Conference 2018 of the Boao Forum for Asia last April that China will not close its door. China will only open its door even wider to the world. This is not only a serious policy announcement. It is also a call to action. Further open up the service sectors, such as telecommunications, education, medicare and elderly care, and in particular, take major steps to open up the financial sector. The People's Bank of China took the lead in announcing a timetable for opening up the financial sector. The island of Hainan as a whole is turned into a pilot free trade zone. Tariffs on automobiles are cut by a large margin. With regard to foreign investment, China has issued the Notice on Several Measures for Utilising Foreign Investment Actively and Effectively to Promote High Quality Economic Development. This document has introduced 23 investment-friendly policy measures in six areas, including but not limited to investment liberalization, facilitation, promotion and protection. 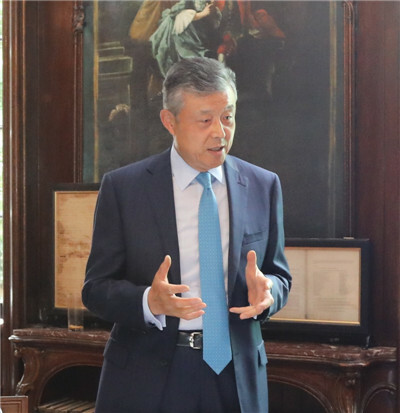 The Shanghai-London Stock Connect is expected to be launched by the end of this year. In Shanghai this coming November, China will host the world’s first national-level exposition that focuses on import. All these measures will deliver tangible benefits to British companies. I know you must have been following the trade war between China and the United States very closely and wondering if this is going to affect China’s openness in any way. I can tell you this: China’s position is clear and firm. China does not want a trade war. But China is not afraid of a trade war. We are fully prepared for all possible scenarios, but we would never be the first to pull the trigger. In fact, China has made tireless efforts to avoid a trade war. We are forced to take the current counter-measures because we have no other choice, and these counter-measures are justified and are taken with restraint. They are taken not only to safeguard China’s own interests but also to uphold the rules-based multi-lateral trade regime and to sustain the hard-won momentum of global recovery. China will not allow the trade war to hold back its opening up drive. Rather, China will continue to achieve development through deeper reform and further opening up according to our own schedule. Second, we need to seize the opportunity of the Belt and Road Initiative. This year marks the fifth anniversary of the BRI. Over the past five years, the BRI has achieved remarkable success. More than 80 countries and international organizations have signed agreements on cooperation with China. From 2014 to 2017, trade volume between China and countries along the routes exceeded $4 trillion, and investment from China to these countries was over $60 billion. A highlight of the BRI cooperation is the Belt and Road Forum for International Cooperation (BRF) held in China in May last year, where over 270 cooperation outcomes were signed. In 2019, China will host the second BRF to work out plans for deepening Belt and Road development. The BRI is an important public good that China offers to the world. It is initiated by China but its outcomes are for the whole world to share. The UK has a competitive edge in financial and legal services. It is a natural partner in BRI. There is every reason for the UK to take a leading role in international cooperation on the BRI. I am happy that Sir Douglas has been appointed by the British Government as the Special Envoy for the BRI. Recently he was invited to sit on the BRF Advisory Council. Let me take this opportunity to express my congratulations to Sir Douglas. Third, we need to seize the opportunity of development of the Guangdong-Hong Kong-Macau bay area. This is a national strategy that is designed, deployed and promoted by President Xi Jinping. The Guangdong-Hong Kong-Macau bay area has a population of 70 million, larger than that of the UK, and a total GDP of over $1.3 trillion, equivalent to that of Spain. It also has some unique features, which is summarized as one country, two systems, three currencies and three customs areas. These features will help Guangdong, Hong Kong and Macau complement their advantages, engage in win-win cooperation and achieve coordinated development. I believe that the Guangdong-Hong Kong-Macau bay area and the Belt and Road Initiative will give wings to Hong Kong’s development and enable its economy to take off once again and fly higher and farther. 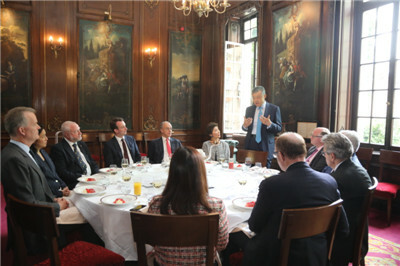 Since the founding of the Hong Kong Association, you have been contributing to the cooperation between Hong Kong and the UK, and to the overall China-UK relations. I sincerely hope that you will continue to uphold “one country, two systems” firmly, and help the British people see Hong Kong-related issues in a comprehensive, objective and fair light. It is also my hope that you will seize the three opportunities I listed out, work for the prosperity and stability of Hong Kong and contribute to a new chapter of China-UK “Golden Era”!